Oatmeal stout has long been one of my favorite beer styles. The roasty and chocolate notes of the darker malts pair well with the smooth mouthfeel derived from the oats. I was first exposed to oatmeal stout years ago in a German restaurant, of all places, that had bottles of Samuel Smith's Oatmeal Stout. The flavor of that commercial example drove me to try to make my own. I tried several extract recipes and then settled on a favorite, the "McQuaker's Oatmeal Stout" recipe from Jamil Zainasheff and John Palmer's book Brewing Classic Styles. The recipe goes a bit heavier on some of the specialty grains than other recipes I have encountered, but it produces a wonderful product. 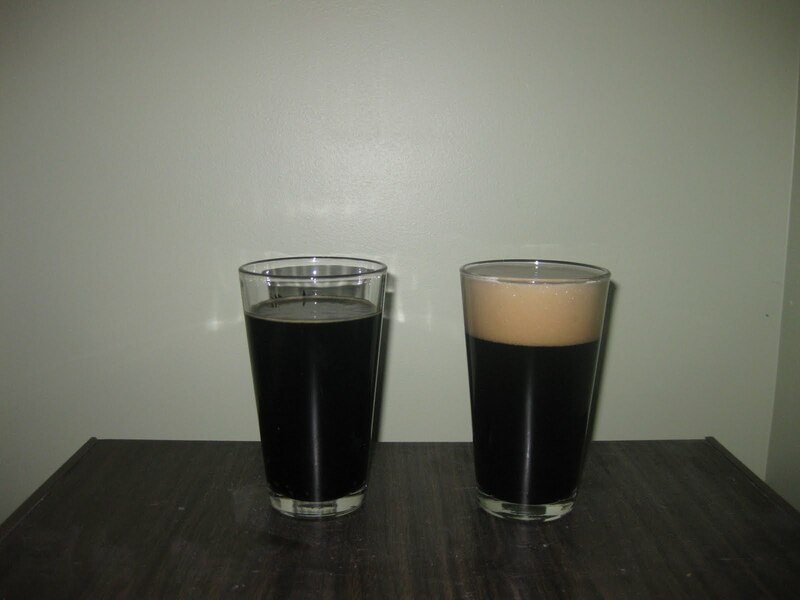 I brewed a double batch of this recipe with a friend who loves stouts back in March 2010. My friend received half of the recipe, bottle conditioned, and I kegged the other half. He surprised me with a gift of a bottle recently, almost a year and a half later, and stated he thought the beer aged wonderfully. I currently have a batch of the same recipe on draft and though comparing the two would be an excellent way judge the stout's ability to age. The most striking difference between the appearance of the two beers is the head. The older bottled version (pictured on the left) had a thin head with very coarse bubbles. These dissipated rapidly and left a thin film of a head within a few minutes. The kegged version had a thick pillowy head that lasted through most of the tasting session. The color of the beers was slightly different, with the newer version showing strong ruby highlights when back lit, while the older version being almost completely black. The aromas also differed between the two beers. 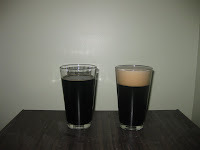 The aged version featured less roast character than the younger beer, while they both exhibited a dark chocolate aroma. The aged version also had a hint of oxidized alcohol in the aroma, much like sherry, but far more subtle. The largest difference between the two was in flavor and mouthfeel. The aged version, as suggested by the aroma, had a fair amount of oxidized alcohol character. This flavor was complex and even featured a warming effect, which was unexpected. The roast coffee and chocolate flavors were subdued and the mouthfeel was missing the "slickness" often found in oatmeal stout. The newer version featured much more of the smooth roast and chocolate that characterize the style, which sometimes reminds me of what I loved about chocolate milk as a kid. My overall impression is that the older beer presents a more complex flavor profile, with its oxidized sherry notes and warming alcohol. The newer beer seems more in tune with what I expect in an oatmeal stout, particularly in the mouthfeel. While I liked them both, I prefer the younger one. If you have ever had the opportunity to taste the difference between an aged and young version of a beer, please leave a comment and let us know. I know this post is from more than a year ago, but I just brewed this exact recipe (it's now in a secondary) and was wondering what your experience has been on how long to let it condition. I don't have a keg system yet, so am just trying to decide how long to let it all batch condition before bottling. Thanks for the question, Coffeeclimber. I had another bottle of the older batch from the same friend 6 months or so ago, and it had definitely thinned out. I would guess that I have most enjoyed those stouts with finely crushed roast malt about 6 months after brewing. The are definitely good before then, but some of the "chalky" flavor seems to fade around that time, which I heard could be because very fine sediment from the roasted grains takes a while to settle. They rarely last that long around my house, but I am grateful that my friend is more patient with his half of the batches. I think you can bottle whenever you like, after a few weeks in primary, and then let the beer condition in bottles over time. I don't think there is a benefit to aging in bulk over in bottle after the yeast has finished cleaning up the fermentation, but that is just my opinion.